The Barn Owl is one of the most widely distributed birds in the world, found on every continent except Antarctica. In Tennessee it is a regular, but rare permanent resident. Most likely due to loss of habitat, populations appear to be in decline. The Barn Owl was listed as In Need of Management in Tennessee in 1976. The Barn Owl is a slim, medium-sized owl with long legs that are sparsely feathered. The heart shaped-face and pale plumage makes it the easiest of the five Tennessee resident owls to identify. The back and wings are tawny with black and white spots. The head is rounded without ear tufts and the eyes are dark. The female is slightly larger with more distinct plumage than the male. The Barn Owl is found in open areas that support healthy rodent populations such as grasslands, pastures, marshes, hayfields, and parks dotted with trees and/or man-made structures. Manicured agricultural lands tend to not be very suitable habitat due to the lack of hunting perches and nesting sites. Barn Owls typically hunt rodents and other small mammals, but they also eat birds, reptiles, amphibians and insects. It is nocturnal and hunts from a perch or on the wing, flying close to the ground. When it comes to nesting, the adaptability of the Barn Owl may have contributed to its worldwide distribution. Depending on what is available, it nests in hollow trees, cliff cavities, river banks and in human structures of all kinds, including barns, church steeples, deer blinds and abandoned buildings. Usually monogamous, pairs remain together as long as both individuals live and they may breed more than once a year. Nesting may occur in most months of the year, however nesting is likely concentrated from spring through early fall. Clutch size: 2-18 dull white eggs. The number of eggs appears to depend on local food supply. Incubation: Female incubates the eggs alone for about 30 days while the male feeds her. Both adults feed the young, which are able to fly in about 60 days. The fledglings will return to the nest site to roost for several weeks. The Barn Owl does not give a rhythmic hoot or a clear territorial call that are typical of other owls. The calls are clicks, harsh screeches, and whistles. •	The Barn Owl has smaller eyes than other nocturnal owls suggesting that it relies more on hearing to catch its prey. Indeed, it has the most acute hearing of any animal tested. The facial feathers make a heart shaped ruff. On each side of the face there is a movable ear flap that changes the shape of the ruff to form cones that funnel sound into asymmetrically placed ear canals. The ear on the left angles downward, while the right ear angles upward providing more sensitivity to sounds from different directions. They can catch mice in complete darkness in the lab, or when hidden by vegetation or snow out in the wild. •	Most Barn Owls begin breeding at one year old. The oldest known wild Barn Owl was 15 years old. •	The Barn Owl has a distinctive heart-shaped, white face. Curiously, it has earned the nickname "monkey-faced" owl in rural parts of Tennessee. We have included the most common box design for Barn Owls. Boxes can be erected on poles in open fields, in barns, or in unused grain silos. All boxes should be in or near good hunting ground and exit holes should face open areas with a clear line of flight. 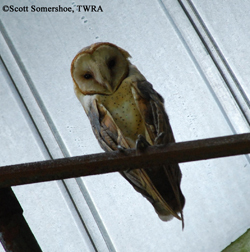 We recommend placing boxes 20 to 25 feet off the ground, but Barn Owls will use boxes only 12 feet off the ground. 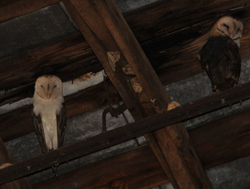 Barn owls are known to nest in close proximity to one another, in some cases with many pairs in one barn, however we recommend not installing boxes within 100 feet of one another. Boxes erected in silos should ensure continued access through the silo roof or sides. Place boxes in barns such that the opening of the box exits through the side (end) of the barn. To enhance a silo or barn, secure large branches between beams high up in the barn. These branches will be heavily used for perches.